RGBS was the prime contractor for the Lackland Self Storage Smart Solar Metering Project. The implementation of an Advanced Electrical Metering and IT Infrastructure was required for revenue grade measurement and verification of electrical production at 36 separate facilities. installations. RGBS teams performed design, installation and engineering. Engineered drawings provided installation detail for networking, metering, and monitoring hardware and software components. After the complete installation, the monitoring system automatically collected and analyzed the electrical data through web based software and hardware. The project was a success for Lackland Self Storage and its ability to monitor, report and alarm on all aspects of the Solar Monitoring System. This Project was built upon the VLAN Network for monitoring the 36 facilities. The facilities were located in different parts on NJ, but connected through Lackland Self Storages VLAN. All meters were recorded locally and then pushed information to the server which was located in GreenBrook NJ. Extensive analytics were accomplished on the data for reporting to the state and government for kilowatt production in reference to SREC reporting. 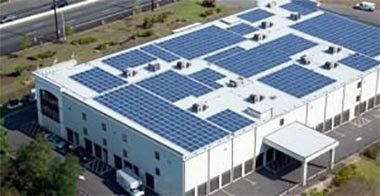 Lackland Self Storage Smart Solar Metering Project has 36 Facilities and is using network based metering technologies for its monitoring in GreenBrook NJ.